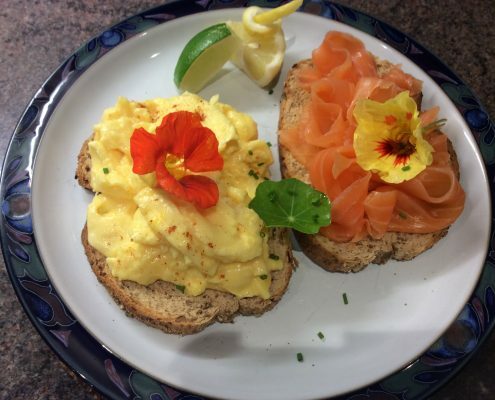 Our award-winning breakfasts, made using quality, local produce will set you up for the day. The breakfast room was formerly the kitchen in Victorian/early 20th Century times, retaining the original sandstone surround for the former cooking Range which in recent years, houses a cosy Jøtul wood burning stove, lit in the colder months. 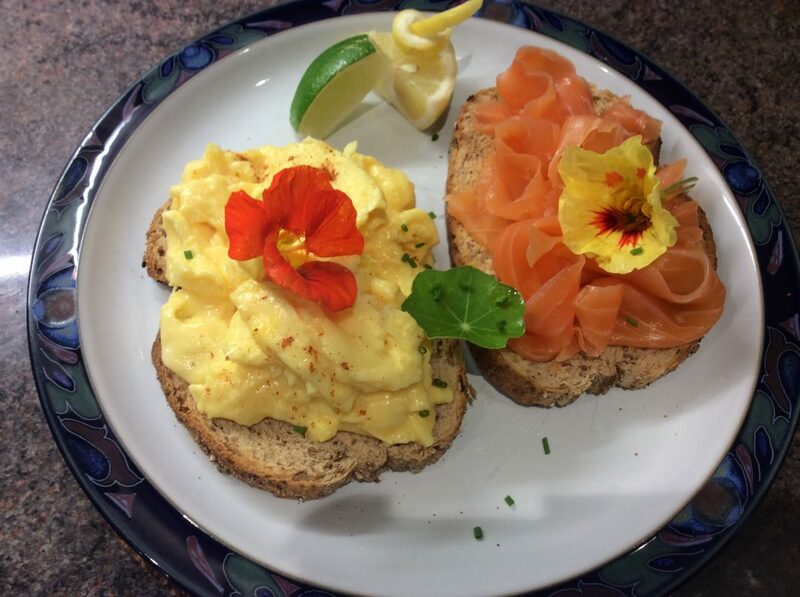 Our award-winning breakfasts include a diverse range to suit all palates including vegetarians and vegans. Quality, locally sourced produce is used on our menu. 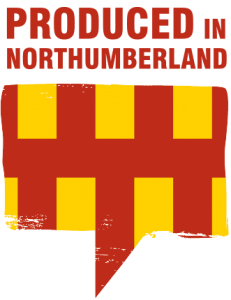 We are very proud to be members of the Produced in Northumberland accredited scheme which supports our excellent, independent suppliers and producers in the region. Breakfast is served at one large table, in a relaxed and friendly atmosphere. Cooked breakfast times are 8.00, 8.30, 9.00 and 9.30 am. We ask that your breakfast and chosen time is pre-ordered the night before so we can ensure that it is served freshly-cooked-to-order and to your exact requirements. In addition to our cooked variety, we provide freshly prepared fruit, natural yoghurt, homemade muesli, cereals, toast and our own homemade preserves. Bacon, sausages and black pudding are sourced from Carter’s of Bamburgh, a Rick Stein’s Food Hero. The famous Craster Kippers and smoked salmon are also included on our menu. Bread is from a local, family-run bakery and free-range eggs are also from a local farm. In addition to the cooked variety we offer freshly prepared fruit, natural yoghurt, fruit juices, cereals and toast, together with a selection of Ringtons teas or `Daily Bread’ roasted and freshly-ground coffee, from Pilgrims Coffee on Holy Island. The former role of Post Office House is acknowledged with vibrant post box fabric at the large window overlooking the courtyard. The post office theme extends to our wacky wing-back armchair with its’ brightly coloured stamp fabric. Nut or wheat allergy: We use nut and wheat products every day in our kitchen and breakfast room and whilst we ensure every care is taken to avoid contamination with nuts or seeds, we cannot guarantee this. This also applies to coeliacs; we cannot guarantee fully that there will be no cross contamination with gluten products. We are sorry but we do not provide evening meals. We have many eating establishments in and around Belford. Please go to the `Local Area’ section on our website where there is a comprehensive list we have put together, either from our own recommendation or guest favourites! We no longer provide packed lunches as we have a very good, local Co-op in the village who stock a variety of sandwiches and light snacks. We are keen supporters of shopping locally and aim to be as environmentally friendly where possible to reduce food mileage and waste. This also helps our small, independent businesses, market towns and local economy to thrive. This applies also to recycling; paper, plastic, bottles, tins, cardboard and garden waste are recycled. We also re-use newspapers – for lighting our two stoves and also very useful for stuffing wet walking boots! 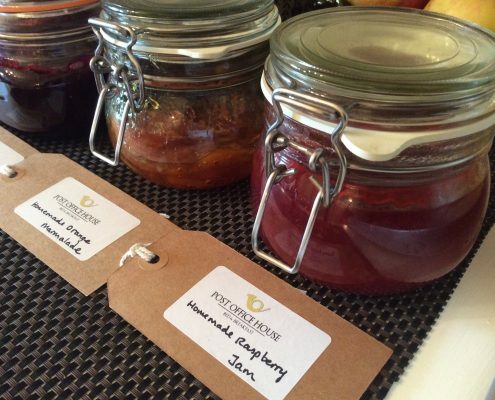 All our marmalade, jams and muesli are homemade on the premises. 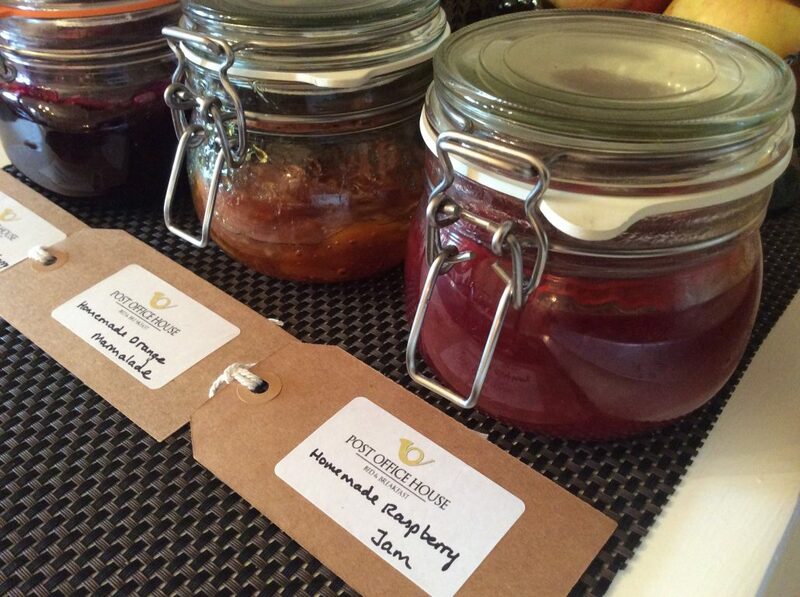 The fruit used to make our jams are very local! Blackberries are hand-picked by ourselves, from the wild bushes in and around Belford in the Autumn season and raspberries/strawberries are handpicked by us in the summer months from a local farm. Our ground coffee from Pilgrims, is delivered to us in large reusable plastic tubs. When we need more, the `refillables’ come in biodegradable packets which can be composted.